Madame Tussauds Hollywood welcomed a new wax figure last week. The famed tourist destination introduced Jason Derulo’s wax figure as the newest addition to their third-floor A-List party room. With high anticipation and the longest countdown to a reveal, Derulo was ecstatic. “Are you serious right now? 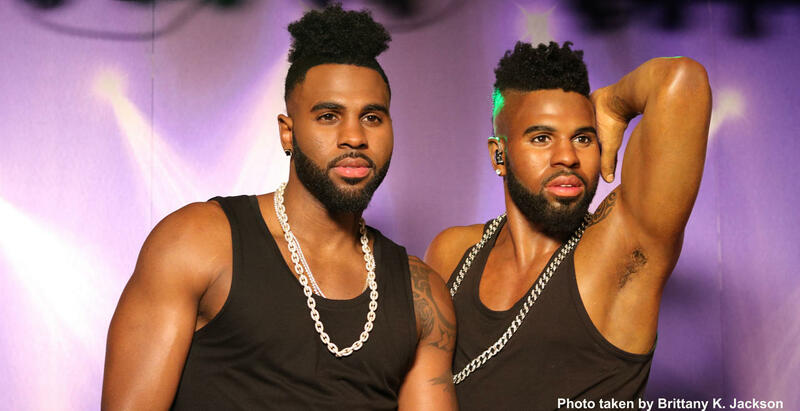 That’s a handsome guy,” Derulo said as the curtains revealed his wax figure twin. “Oh my goodness! I just definitely want to say thank you. Thank you so much to Madame Tussauds. This is legendary. This is a place you always past when you are driving down Hollywood. To be part of the family now is unbelievable. I couldn’t be more excited,” Derulo expressed. Making a perfect wax figure is no small thing. Derulo had over 250 measurements taken. “Jason’s figure is our most dynamic yet! It made for a very interesting setting, which took almost three hours. We had to ask Jason to recreate one of his signature dance moves numerous times to ensure a perfect recreation, “ said Colin Thomas, Senior Manager of Madame Tussauds. To dress the figure, Derulo was happy to donate a pair of Golden denim jeans and a pair of red Nike Air Force One sneakers which are valued at $350,000. After the unveiling, Derulo headed to the rooftop of Madame Tussauds for a special concert. He sang many of his hits, including “If It Ain’t Love”. Industry guests were thrilled, but the most excited were those from the Make-A-Wish Foundation. Children as young as two years old who suffer from a life-threatening medical condition had their dreams of meeting Jason Derulo fulfilled. They were able to take photos with Derulo and sing along as he took over the stage. With all the excitement, MillionaireMatch was able to speak to Jason about his career and love. He gave us a few tips for a successful relationship.